Tutorial: I'm gonna teach you to sew! For all of those who want to learn to sew but don't know where to begin, this is it! I'm hosting a sew-a-long where I will go through the steps to sew this apron and you can sew along with me! Before the sew-a-long, you will need to know the basics of how to work your sewing machine like how to thread it, winding the bobbin and machine operation. All sewing machines are different (otherwise, I'd cover that too!) but you can check your sewing machine manual for detailed instructions on these things. 1. )A Sewing Machine- dig out yours or borrow from a friend or relative. 2. )A sewing machine needle- If you have an old needle, put in a fresh one. 3. )Fabric scissors- make sure they're good and sharp! 6.) An Iron- You will need an iron and ironing board for pressing seams and ironing your pattern. 8. )Fabric make sure it's cotton. For beginners, it's the easiest to sew on! * Don't be afraid to ask fabric store employees for help! They know a lot about sewing and are always happy to help beginners! The sew-a-long will be broken up over 3 days. If the sew-a-long goes well, we'll do a whole dress next time! Always vintage-inspired, of course!! Shoot! My sewing machine is still at my moms. We didnt have room for it til we just moved into our house. I just got a machine; I am very excited about this! Thanks! Great idea! I can handle the apron but will be following along to enjoy everyone else's experience. Looking forward to the dress tutorial though - I can always use some hints with something like that!! This is going to be so great! 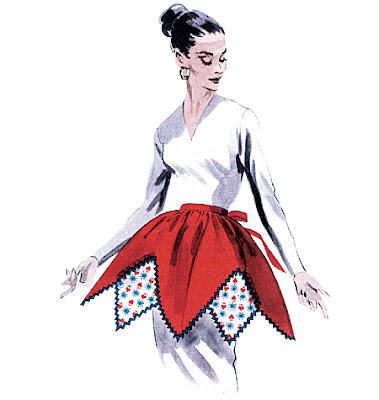 I really want to learn to sew and an apron sounds like a great place to start. I probably won't be able do this, but this is such a great idea for a blog! This is a great idea, I've been sewing for years and often people say I couldn't sew on a button but I know it's fear and lack of knowledge, good on ya! this is such a great thing you're doing! Thanks, ladies! I only hope that my tutorials are easy to understand! :) Should be fun!! I am thrilled that you are doing this! I have been wanting to try to sew an apron. I just bought all of my supplies today! My mom gave me a sewing machiene two years ago and this will be the first time I use it (I have been too intimidated to try)!! One teensy problemo though I volunteer at a camp for kids so I will be away next friday night for the cutting . . .will I be able to read the instructions on your blog on SAT? I want to do this, but will be out of town that weekend too. Monday morning, no wait, I'm gone Monday too. Tuesday morning I will definitely be checking in to start my project. Can't wait! my local fabric store will have butterick patterns on sale this week for $1.99. I plan to do a little stocking up and was wondering if you were planning to more butterick patterns for future sewing tutorials . . . I actually have this pattern. I have been sewing for almost 40 years and I hate to admit that this is one of the few patterns that defeated me. The whole apron was thrown in the rag bag. I guess I will have to dig it out and give another try. Scallops also defeat me--they just never have a pretty curve to them when I finish. I was wondering about pinking shears. I told my husband I needed some because that is what my grandmother always used to keep the edges from fraying. Is this correct? I'm new to sewing. Can not wait for this tutorial to start off to find the pattern and fabric during my lunch hour today. Missy, yes you are right! The zig zag created by the pinking shears keeps your fabric from fraying. There are many other non-fray methods but in the old days, every lady had a pair of pinking shears in her sewing box! Darn! I would really love to join this, but just found you tonight :-( I don't have that pattern.